District Superintendent Dr. Gladys I. Cruz, Board President John Hill and Paul’s children, Paul Jr., Karilyn and Lauralee accept the G. Lucius Cary Annual Service Leadership Award on behalf of their father, the late Paul Puccio. 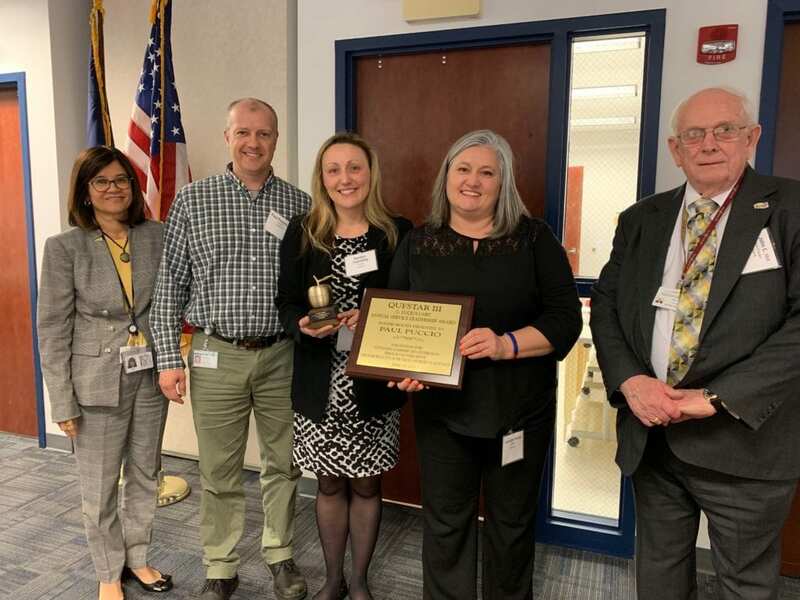 Questar III presented the family of the late Paul Puccio with its 18th annual G. Lucius Cary Service Leadership Award at its annual meeting on April 10. 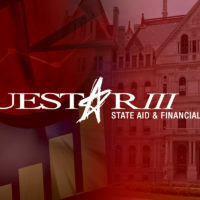 This was the second time in Questar III’s history that the award was presented posthumously. The G. Lucius Cary Award is given in recognition of outstanding leadership and contributions through volunteer service – reflective of the values and beliefs of Questar III. The award is named for former Questar III board member, G. Lucius Cary. Puccio, who passed away on February 26, 2019, dedicated his life to public service and community involvement. He served as a Questar III board member for 20 years. He was a founding member of the Tech Valley High School Operating Board, serving as its first president from 2006 to 2018. He also served on the Schodack CSD Board since 1981, including nine years as president. Questar III Board President John Hill, who presented the award to Puccio’s family, recalled Puccio’s passion for public education. “What he told us was the more you can give to your community, the more you can volunteer, the better person you’re going to be. His legacy will continue. 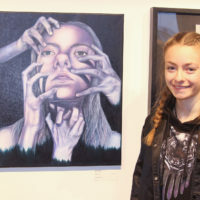 We think about him non-stop, what would dad do, what would dad say, and I hope you all have that same feeling,” said Paul’s daughter Karilyn Tremblay. “Clearly he was surrounded by like minded people and I think that helped him get through life, to be around people who saw things the same way he does, and you all did that,” said Paul Puccio Jr.
Paul’s daughter, Lauralyn Kulpa encouraged those in attendance to remember her father’s motto as budget season begins. “My father’s motto was one of ‘think outside the box’. Don’t be afraid to think outside the box. Your children and your communities deserve that, and that was his strength and that is his legacy,” she said. Questar III District Superintendent Dr. Gladys I. Cruz said Puccio was an extraordinary individual who is deeply missed. “Paul was such a wonderful individual who devoted his life to helping others, and he was a tireless advocate for students across our BOCES region. His generosity, his kindness and his selfless giving of his time over the 20 years he served on the Questar III Board of Education was a true testament to who he was and what he stood for. It was a true honor and privilege to know him, to admire him and to work with him. He will forever be missed,” said Cruz.